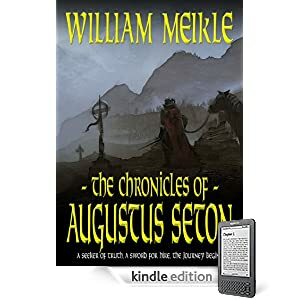 Today I turn the keyboard over to William Meikle, a writer of fine fantasy adventure and things gnashing in the night.He’s here today to promote his book, The Chronicles of Augustus Seton. Over the years I’ve written many stories set in my native country, in particular in the Watchers series. That series was written ten years ago now, and ever since I’ve been itching to write some more historical fantasy set in Scotland. I’ve toyed with several ideas, but it was only last year that things started to firm up. It took the death of two of my favorite writers to give me a kick. David Gemmell’s muscular swordplay and Robert Holdstock’s grip on mythic archetypes and the importance of history mixed in my head and gave me a sword-for-hire in 16th Century Scotland. The late 1590s were a time of turmoil. Scotland was on the verge of many changes that would shape its future, from religious reformation, to the union of the crowns with England. But in many ways the country was still rooted in its medieval past, and fear of witches and demons was still a large part of everyday life. Seton confronts demons, both internal and external, as he wanders on the fringes of history. Robert Howard has covered similar ground with Solomon Kane, but I wanted Augustus Seton to be more of a pragmatist, a man set on his path through having succumbed to his baser desires, and now forced to pay the penalty. Seton’s antecedents are characters from my teenage reading: the aforementioned Kane, Moorcock’s Elric and Corum, and, possibly the main one, Gemmell’s Jon Shannow, the Jerusalem Man, forever seeking personal redemption. I also want Seton to be a seeker after truth, continually trying to find ways to explain the supernatural events that shaped him. This will lead him down many Fortean alleys, confronting demons and witches, but also getting involved in other manifestations of the weird, from the Grey Man of Ben MacDui, to the Kilbirnie Wyrm and even encounters with the Grim Reaper himself. Which brings me to more of Seton’s antecedents – occult detectives, like Carnacki and John Silence, through to Karl Kolchak. Like these others, Seton, as he gets more experienced in the ways of the Dark Side, finds that the weird seems to seek him out for personal attention. This gives me a chance to mix history with fantasy, playing with the wide variety of tales in Scottish Folklore, and making up some of my own. My goal here is to attempt to blend fact and fancy such that the reader can’t be sure if they are dealing with myth or history, folklore or things plucked from my mind. And yet again, there are antecedents from which I’ve drawn. Scotland has produced several writers willing to weave the country’s history and magic into their stories, from Stevenson’s Kidnapped, Walter Scott’s romantic fancies, and John Buchan’s taut thrillers. Stevenson in particular manages to provide fast paced entertainment that also educates even as you’re carried along by the sheer page-turning brilliance of his plotting and the solidity and truth of his characterisations. That’s what I’m striving for with Seton. He’s still a character in development. The four stories in this collection are his first adventures in what I hope will become a long and wild career of monster smiting, demon slaying and general mayhem with a bit of history thrown in. I hope you have half as much fun reading them as I had writing them. The Chronicles of Augustus Seton are available on ebook from all the usual suspects. Fascinating — will have to seek this out, William. Love Scotland, beautiful place. Must check your books out. Well, I did my 1st book review ever since I did book reports in school about the beginning, not of “The Chronicles…”, but of “The Valley” but hadn’t finished the book yet. If you enjoy 9-foot killer scorpions & other strange creatures (I won’t name my favorite-find out for yourself), you’ll LOVE this book! This book begins on full throttle with the discovery of a ghost town and speeds up from there when a strange crab-like thing attacks the men’s horses. From there you venture into a lost land filled with a few different creatures, and new threats around every corner. It’s FUN!! I especially enjoyed how possible it all could be. Halfway through this book I rushed back to amazon.com to purchase more William Meikle works, of which I found many to get me started. Watching the different reviews and interviews with this author, I think I’ll soon be heading back for more!! If you like monsters, you’ll love Meikle’s creative flare for inventing them!! Damn!! Another I have to add to my TBR List. Way to go Wille!! Historical Fantasy! I read another series based in Scotland and really enjoyed it! I can’t wait to give this a try!